Below is list of legislation that Gov. 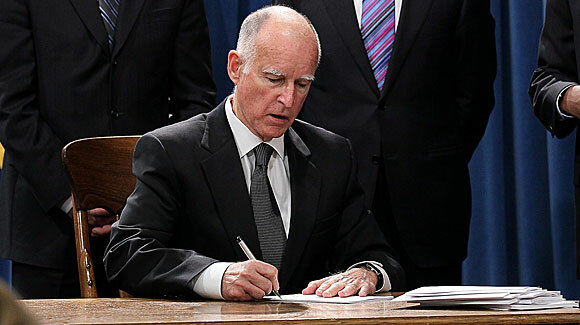 Jerry Brown has signed into law as of Monday, October 2. Among the bills Brown signed was Senate Bill 432, emergency medical services, which was sponsored by Sen. Richard Pan (D -Sacramento). AB 149 by Assemblymember Reginald Byron Jones-Sawyer Sr. (D-Los Angeles) – Personal income taxes: Habitat for Humanity Voluntary Tax Contribution Fund. AB 331 by Assemblymember Susan Talamantes Eggman (D-Stockton) – County recorders: veterans: recorded documents. AB 352 by Assemblymember Miguel Santiago (D-Los Angeles) – State Housing Law: efficiency units. AB 360 by Assemblymember Al Muratsuchi (D-Torrance) – The State Bar: pro bono legal assistance: veterans. AB 390 by Assemblymember Miguel Santiago (D-Los Angeles) – Pedestrian crossing signals. AB 462 by Assemblymember Tony Thurmond (D-Richmond) – Mental Health Services Oversight and Accountability Commission: wage information data access. AB 527 by Assemblymember Anna Caballero (D-Salinas) – Pest control aircraft pilot’s certificate: unmanned aircraft. AB 556 by Assemblymember Monique Limόn (D-Santa Barbara) – County ordinances: violations: fines. AB 562 by Assemblymember Al Muratsuchi (D-Torrance) – California State Auditor: interference. AB 575 by Assemblymember Reginald Byron Jones-Sawyer Sr. (D-Los Angeles) – Elder and dependent adult abuse: mandated reporters: substance use disorder counselors. AB 611 by Assemblymember Matthew M. Dababneh (D-Encino) – Mandated reporters of suspected financial abuse of an elder or dependent adult: powers of attorney. AB 722 by Assemblymember Monique Limόn (D-Santa Barbara) – Isla Vista Community Services District: board of directors. AB 727 by Assemblymember Adrin Nazarian (D-Sherman Oaks) – Mental Health Services Act: housing assistance. AB 974 by Assemblymember Sharon Quirk-Silva (D-Fullerton) – Mental Health Services Act: reporting veterans spending. AB 1134 by Assemblymember Todd Gloria (D-San Diego) – Mental Health Services Oversight and Accountability Commission: fellowship program. AB 1277 by Assemblymember Tom F. Daly (D-Anaheim) – Dentistry: Dental Board of California: regulations. AB 1315 by Assemblymember Kevin Mullin (D-South San Francisco) – Mental health: early psychosis and mood disorder detection and intervention. AB 1520 by Assemblymember Autumn R. Burke (D-Inglewood) – Lifting Children and Families Out of Poverty Task Force. AB 1618 by Assemblymember Sabrina Cervantes (D-Corona) – Veteran service providers. AB 1696 by the Committee on Insurance – Insurance omnibus: developmental services. AB 1714 by the Committee on Housing and Community Development – Income taxes: credits: low-income housing: farmworker housing: building standards: housing and home finance. AB 1722 by the Committee on Governmental Organization – Alcoholic beverage licensees: restrictions: coupons. AB 1723 by the Committee on Governmental Organization – Horse Racing Law. SB 19 by Senator Jerry Hill (D-San Mateo) – Public Utilities Commission: duties and responsibilities: governance. SB 36 by Senator Hannah-Beth Jackson (D-Santa Barbara) – Attorneys: State Bar: Sections of the State Bar. SB 52 by Senator Josh Newman (D-Fullerton) – State Route 39. SB 295 by Senator William W. Monning (D-Carmel) – Farm labor contractors: sexual harassment prevention. SB 385 by Senator Ben Hueso (D-San Diego) – Public Utilities Commission: reports: programs: studies: ex parte communications. SB 432 by Senator Richard Pan (D-Sacramento) – Emergency medical services. SB 440 by Senator Robert M. Hertzberg (D-Van Nuys) – Personal income taxes: voluntary contributions: California Breast Cancer Research Voluntary Tax Contribution Fund and California Cancer Research Voluntary Tax Contribution Fund. SB 512 by Senator Ed Hernandez (D-West Covina) – Health care practitioners: stem cell therapy. SB 547 by Senator Jerry Hill (D-San Mateo) – Professions and vocations: weights and measures. SB 564 by Senator Mike McGuire (D-Healdsburg) – Joint powers authorities: Water Bill Savings Act. SB 618 by Senator Steven Bradford (D-Gardena) – Load-serving entities: integrated resource plans. SB 672 by Senator Jean Fuller (R-Bakersfield) – Traffic-actuated signals: motorcycles and bicycles. SB 690 by Senator Hannah-Beth Jackson (D-Santa Barbara) – State Bar of California: disclosures. SB 732 by Senator Henry Stern (D-Agoura Hills) – General plan: agricultural land. Below is the legislation vetoed accompanied by messages. AB 524 by Assemblymember Frank Bigelow (R-O’Neals) – Public utilities: fines and settlements: 2015 Butte Fire. A veto message can be found here. AB 850 by Assemblymember Ed Chau (D-Monterey Park) – Mental Health Services Oversight and Accountability Commission. A veto message can be found here. AB 859 by Assemblymember Susan Talamantes Eggman (D-Stockton) – Elders and dependent adults: abuse or neglect. A veto message can be found here. SB 11 by Senator Ted Gaines (R-El Dorado Hills) – Taxes: interest: penalties. A veto message can be found here.